Once PayPal processes your payment, they will send me a confirmation email and I will email you the Beach Sketches PDF. It may take me a few days to respond. Peaceful, organic, harmonious music; blissfully uncomplicated arrangements; composed on a 26-string harp; beautiful on larger harps as well. Delight in playing these as written or as the “heart” of improvisational interpretations. Ideally suited for intermediate beginners through advanced levels of playing experience. 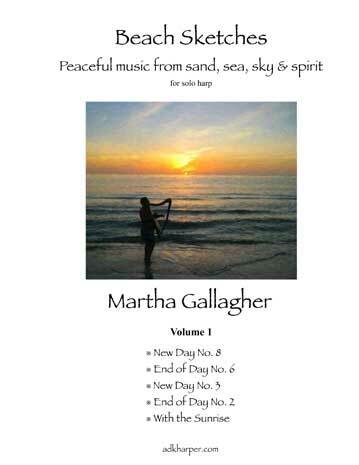 Inspired by sand, sea, sky and spirit, this music is calming, soothing, healing - perfect in hospice or hospital settings, for yoga, meditation or message therapy, in assisted living, memory care settings, as well as liturgical, spiritual settings - and, of course, right in your own home.